The controversial €6.5m redevelopment of Eyre Square in Galway city has run into further difficulty. Work on the site has come to a standstill following the withdrawal of staff employed by the main construction company, Samuel Kingston Construction. 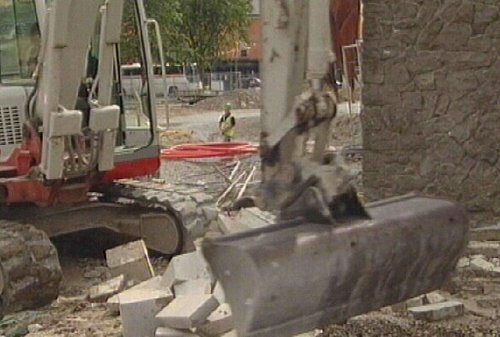 Galway City Council says it is shocked that the company has abandoned the project and it will now have to find another company to complete the work. Work on the redevelopment of the square began in May of last year and was due for completion this October. There has been constant criticism of the project because of the slow progress of the work and the major disruption it has caused to local businesses. So far today there has been no statement from Samuel Kingston Construction. Galway City Manager Joe McGrath told RTÉ News that the firm had given the city council no reason for abandoning the project, and there were no outstanding issues of payment. He said he was extremely disappointed, annoyed and felt very let down. The Chief Executive of Galway Chamber of Commerce, Michael Coyle, said this latest setback to the project was a terrible blow for the city and would have the most serious consequences for businesses during the peak tourist season. SIPTU organiser Pat McCabe said one of the union's concerns was that another group of Polish workers who were employed on the scheme were now laid off and were facing an uncertain future.